Castlebar, the heart of Co Mayo, is a perfect point from which to visit the wild coast of the West of Ireland. Located only 15 minutes from scenic Westport town, Castlebar boasts all year round charm and a truly welcoming atmosphere. Explore this charming area from the comfort of the Harlequin Hotel and enjoy all that the West has to offer. The Harlequin Hotel is centrally located in the heart of County Mayo in Castlebar Town Centre. Castlebar’s only 4 Star hotel, the boutique property is the perfect base for you to discover this beautiful and inspiring region. Stunning natural beauty, vibrant urban centres and a quality of life unmatched anywhere in the country of Ireland awaits you. Explore the Wild Atlantic Way, cycle the Great Western Greenway Route, visit one of the many stunning offshore islands, walk up to the peak of wild mountains or experience challenging outdoor activities. Enjoy the best of Irish Cuisine using the freshest local ingredients washed down afterwards with a pint of the black stuff in a traditional Irish pub. With so much to offer it’s hard not to fall in love with Mayo. The Harlequin is a very popular hotel for short breaks in Ireland. Style-conscious guests love the unique ambience and contemporary feel of this Chic Boutique style hotel with the unusual décor and quirky colour schemes an enduring favourite. We love their style, but comfort and your enjoyment is of paramount importance. From the Heavenly Hypnos beds to the Foyer Restaurant where you can dine fabulously with skilled chefs preparing dishes using delicious local ingredients in a delightful space with warm welcomes. It is no wonder guests are reluctant to leave! 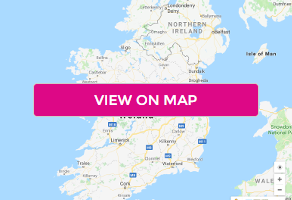 Explore the Great Western Greenway Cycle Route which runs from Westport to Achill, climb majestic Croagh Patrick or explore one of Mayo’s many offshore islands, take in a show at the Royal Theatre which is located directly next door to the Harlequin Hotel or simply unwind and relax with some retail therapy in Castlebar town.